My favorite film from last year, Abbas Kiarostami's beguiling, engrossing Certified Copy is a masterful rumination on relational authenticity, the vagaries of human perception and the nature of cinema itself. Like many of Kiarostami's films, it's can be playful and self-reflexive, acknowledging the audience directly and forcing the viewer to become an active participant in the film's mysteries. In the hands of a lesser director (although a lesser one wouldn't likely be so ambitious), Certified Copy could exist as merely an intellectual exercise, but for all of its pointedly cerebral flair, this is an incredibly emotionally rich film. Opera singer William Shimell stars as James Miller, a British scholar in Tuscany to lecture on his latest book, a treatise about the relationship between original pieces of art and their copies — a work in which he asserts that a copy can be just as valuable (or valued, at least) as an original. Juliette Binoche stars as an unnamed local antique dealer who's somewhat taken with James and his ideas, and arranges for them to spend an afternoon together. Initially, it appears as if the two strangers are simply getting to know one another as they travel to the nearby village of Lucignano, where a number of weddings are in full swing. She spars testily with him over some of the ideas in his book, while he seems increasingly reluctant to go along with her plans. Then, midway through the film, Kiarostami flips a switch and seems to turn everything on its head. Making a stop for coffee at a small cafe, the pair is misidentified as a married couple by the proprietor, but Binoche doesn't correct her, and soon, they're acting like a married couple the day after their 15th wedding anniversary. Their conversation turns to the myriad disappointments and the expectations that have gone unfulfilled in their relationship. They seem to have an intimate knowledge of past details that wasn't there just moments ago. So, the question becomes, who are the real people here, and who are the ones that they were pretending to be? Or is the reality something more complicated? Kiarostami poses the question directly to the audience, ensuring a wide range of perceptions will result in a wide range of proposed realities. 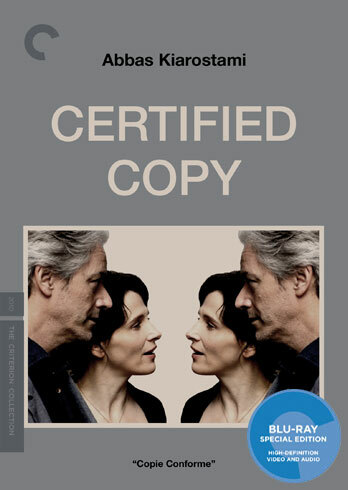 As an intellectually stimulating mind-bender, Certified Copy is totally fascinating, and repeat viewings only enhance the mystery. And yet, as the film goes on, the central enigma fades in importance; far more affecting are the nuances of relational connection between the couple, whether they're real or simply a copy of imagined feelings. The film is a masterpiece on both fronts, but the emotional pull of the film's final scene, set in what may or may not have been the pair's honeymoon hotel, is a succinct encapsulation of what makes Kiarostami such an exceptional filmmaker. Presented in 1080p high definition in its original 1.85:1 aspect ratio, Certified Copy is given an essentially flawless presentation here. Shot on the RED digital camera and kept completely in the digital realm for this release, the transfer is crisp, clean, unwaveringly sharp and packed with fine detail. Naturally, damage is no concern, and the luminous photography looks gorgeous throughout. The 5.1 DTS-HD Master Audio is similarly excellent, presenting an immersive world of ambient sound. Dialogue, which alternates between English, French and Italian, is perfectly clean and clear from the fronts. The big extra here is Kiarostami's ultra-rare second feature, 1977's The Report. With no known negative existing, the only element available is an analog video master with burned-in English subtitles, which this transfer is sourced from. It's rough, but certainly watchable, and the inclusion of this hard-to-find film, which deals with some similar themes to Certified Copy, makes the release a must-buy all on its own. Also included is a new 15-minute interview with Kiarostami, who talks a little about the genesis of the film and production, and goes into some of the themes, including the notion that understanding and love are mutually exclusive in a romantic relationship. He also briefly touches on The Report. An hour-long making-of, featuring interviews with Kiarostami, Binoche and Shimell from on-set, is more standard fare. Rounding out the disc is the pretty atrocious U.S. trailer, which grossly misrepresents the film with cherry-picked lines of dialogue and a tinkling music cue. The package includes a booklet with an essay by critic Godfrey Cheshire, who offers up a nice reading of the film and the way it subverts its expected European art house sensibility. The rare extra film and the superb transfer of this modern masterwork make Criterion's release of Certified Copy one of the best Blu-rays I've come across this year.